The second Arianespace Soyuz mission for O3b Networks deployed four spacecraft to complete this customer’s basic satellite network. Photo is courtesy of Arianespace. These satellites are the latest addition to the company’s Medium Earth Orbit (MEO) constellation, which aims to increase broadband connectivity to the underserved populations around the world. 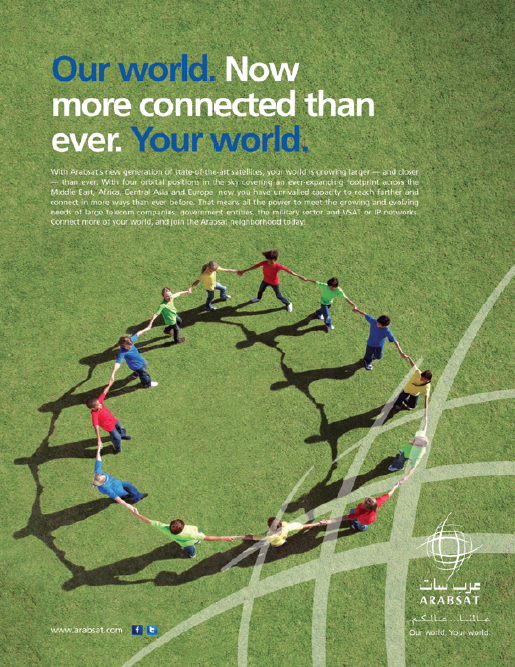 O3b Networks Limited is a global satellite service provider that continues to build a nexgen satellite network for telecommunications operators, Internet service providers, enterprise and government customers in emerging markets. The O3b system will combine the global reach of satellite with the speed of a fiber-optic network providing billions of consumers and businesses in nearly 180 countries around the world, with low-cost, high-speed, low latency Internet and mobile connectivity. O3b, a reference to the “Other 3 billion’’ people on Earth who do not have broadband access, will complete its initial constellation with this launch, heralding the introduction of O3b’s services on a global basis. 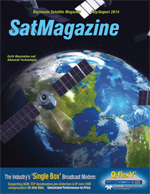 The company, founded in 2007, is already providing services following the launch of its first four satellites in 2013—the O3b system combines the global reach of satellite with the speed of a fiber-optic network, removing the impact that satellite delay has traditionally had on the quality of satellite connections. The launch success—which had a total payload lift performance of more than 3,200kg.—continues the partnership between Arianespace and O3b Networks and builds upon the on-target Soyuz mission that orbited O3b’s initial four spacecraft in June 2013. 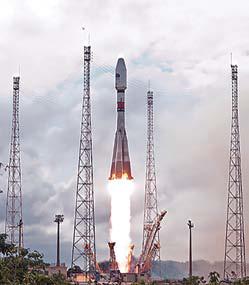 Soyuz is the medium-lift member of Arianespace’s launcher family operated from French Guiana, joined by the heavy-lift Ariane 5 and lightweight Vega. This recent mission delivered O3b Networks’ satellites during a flight lasting 2 hours and 22 minutes—which included multiple burns of the Fregat upper stage, with the four passengers released in two phases from a dispenser system. The latest O3b Networks connectivity satellites are equipped with Ka-band transponders. Along with the four spacecraft launched last year, they form the network framework to provide billions of consumers and businesses in nearly 180 countries with low-cost, high-speed, low-latency Internet and mobile connectivity. The O3b spacecraft were designed, integrated and tested by Thales Alenia Space. With the presence of top officials in the mission control center for this latest launch, Stéphan Israël Arianespace’s CEO also reaffirmed Arianespace’s commitment to continue delivering tailor-made launch solutions with O3b’s specific requirements. Speaking after the satellites’ separation was confirmed, O3b Networks CEO Steve Collar thanked all those involved with the mission success—and gave a special acknowledgement to the Arianespace and Thales Alenia Space leadership in attendance. “The relationship that we have is a unique one— it’s one of partnership, one of cooperation, one of openness and one of friendship,” he added. With the Soyuz, Ariane 5 and Vega launchers fully operational at the Spaceport in French Guiana, Arianespace is the only launch services company capable of delivering any payload into any orbit—from the smallest spacecraft to the largest geostationary satellites, as well as satellite clusters for constellations and cargo missions to the International Space Station. This Soyuz success marked the medium-lift vehicle’s eighth flight from the Spaceport since its 2011 introduction at French Guiana, as well as the fifth Arianespace mission from this equatorial launch site in 2014—for which a total of 12 flights are planned with Soyuz, Ariane 5 and Vega during the year.